, called also Wernerus, or Guarne­Rus, a celebrated German lawyer, was born at Bologna, about the middle of the eleventh century. After studying the law at Constantinople, he taught it at Ravenna, where a dispute arising between him and his colleagues about the word “al,” he sought for the meaning of it in the Roman law; and thence took a liking to it, applied to the study of it, and at last taught it publicly at Bologna in 1128. He had a great number of disciples, became the father of the Glossators, and had the title of “Lucerna Juris.” Thus he was the restorer of the Roman law, which had been destroyed by the invasion of the barbarians. 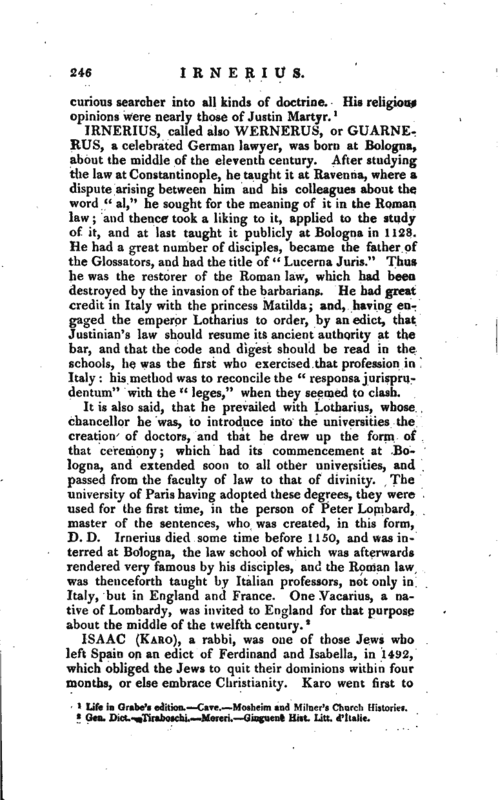 He had great credit in Italy with the princess Matilda; and, having engaged the emperor Lotharius to order, by an edict, that Justinian’s law should resume its ancient authority at the bar, and that the code and digest should be read in the schools, he was the first who exercised that profession in Italy: his method was to reconcile the “responsa jurisprudentum” with the “leges,” when they seemed to clash. Gen. Dict. —Tiraboschi.—Moreri. Ginguent Hist. Litt.‘d’Italie.